A musical extravaganza and winter dance party! Adults $25. Children 5-16 years $10. Under 5 years free. LOCATION Redding Veteran’s Memorial Hall, 1605 Yuba Street, Downtown Redding. With a big beautiful dance floor! 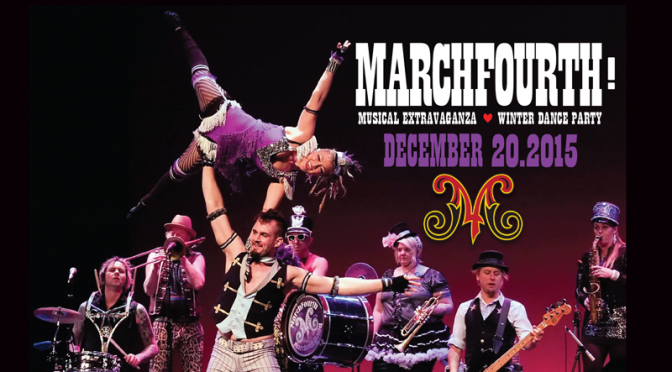 March Fourth Marching Band is something special, a kaleidoscope of musical and visual energy that inspires the audience in an atmosphere of celebration and joy. This show is a big band experience not to be missed! What began as a Fat Tuesday party in Portland on March 4th 2003 appeals to audiences of all ages and musical tastes and has become one of the nation’s best live touring acts. Special guests, The Buckhorn Mountain Stompers are a beloved local band and will add to the fun for everyone. It’s a special treat to have both bands together in this show. Band member Taylor Aglipay is a talented local musician from Trinity County who was a core member of MarchFourth, wrote some of the songs and toured with the band for ten years. The 5-piece percussion corps and 6-part brass section plus funky electric bass will take you on a journey from the swamps of Louisiana to the gypsy camps of eastern Europe to the African jungle by way of Brazil, echoing the deepest grooves of American funk, rock, and jazz then boiling it all together in cinematic fashion with high-stepping stilt-acrobatics and dazzling dancers. Enjoy the show and help build better bikeways, trails, walkable cities and vibrant public places. Previous PostIt Doesn’t Have To Be This WayNext PostCalifornia Street Market Hall – The Pop-up is back!